The Global Volcanism Program has no activity reports for Yantarni. The Global Volcanism Program has no Weekly Reports available for Yantarni. The Global Volcanism Program has no Bulletin Reports available for Yantarni. The Global Volcanism Program has no synonyms or subfeatures listed for Yantarni. Yantarni is a small andesitic stratovolcano located between Aniakchak caldera and Chiginadak volcanoes that was not discovered until 1979. A large breached crater on the NE side, formed by collapse of the summit about 2000-3500 years ago, contains a lava dome that marks the summit. This eruption, which resembled that of Mount St. Helens in 1980, began with a debris avalanche produced by the edifice collapse that was accompanied by a possible lateral blast and followed by the emplacement of 1 km3 of pyroclastic flows related to growth of the summit lava dome. Riehle J R, Yount M E, Miller T P, 1987. 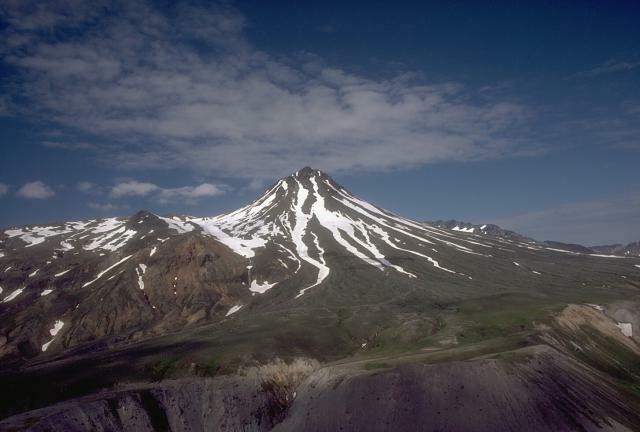 Petrography, chemistry, and geologic history of Yantarni volcano, Aleutian volcanic arc, Alaska. U S Geol Surv Bull, 1761: 1-27. There is no Deformation History data available for Yantarni. There is no Emissions History data available for Yantarni. Yantarni volcano, a small, 1345-m-high andesitic stratovoclano with no known historical activity, is located on the Alaska Peninsula. This view from the east shows the central lava dome forming the summit. The low knobs on both sides of the dome at the height of the long left-hand ridge are remnants of a large crater breached to the NE, which formed during collapse of the volcano about 2000-3500 years ago. Photo by Tom Miller, 1985 (U.S. Geological Survey, Alaska Volcano Observatory). There are no samples for Yantarni in the Smithsonian's NMNH Department of Mineral Sciences Rock and Ore collection. Large Eruptions of Yantarni Information about large Quaternary eruptions (VEI >= 4) is cataloged in the Large Magnitude Explosive Volcanic Eruptions (LaMEVE) database of the Volcano Global Risk Identification and Analysis Project (VOGRIPA).